Is it time to move your office and business but you are feeling a bit overwhelmed? Where to start and how to get the project done without interrupting the business flow? Tune is as I share you can have an organized move whether moving down the hall or across town. Janet M. Taylor podcast producer and host, has displayed an innate tendency for order since childhood. Friends even remarked on the organization of her toys. In 1994 she took her natural ability and started Totally Organized - a business dedicated to working with corporate, non-profit and government agencies saving them time and money by providing contract administration, project management and trainings to save clients time and money. In addition Janet caters to her executive client's personal needs by providing them with strategies to organize their homes and lives. Want a FREE audio book? Go to Audible.com and you can get one. Listen to today's podcast to find out which book I recommend for you Check out my organizing shop on Amazon which has products to help organize your home and life. You have made the decision to live in a smaller space and the thought of where to start to get rid of stuff you don't need is overwhelming. 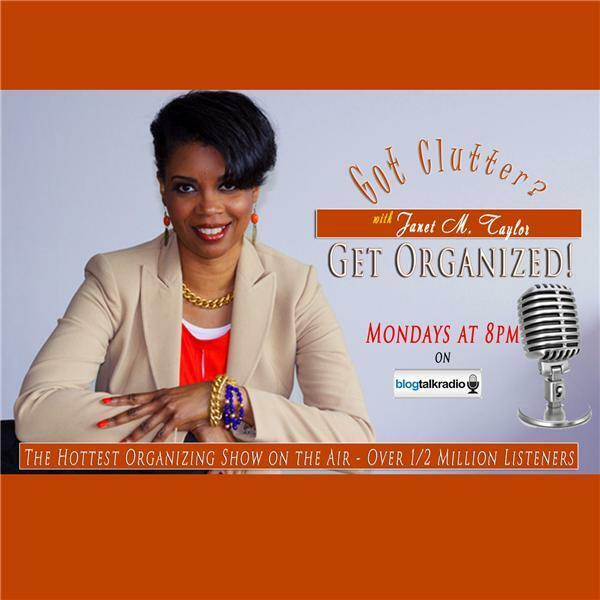 Tune in as I share strategies to get of items you don't need nor have room for to create a new home that is organized and clutter free. Janet M. Taylor podcast producer and host, has displayed an innate tendency for order since childhood. Friends even remarked on the organization of her toys. In 1994 she took her natural ability and started Totally Organized - a business dedicated to working with corporate, non-profit and government agencies saving them time and money by providing contract administration, project management and trainings to save clients time and money. In addition Janet caters to her executive client's personal needs by providing them with strategies to organize their homes and lives. Want a FREE audio book? Go to Audible.com and you can get one. Listen to today's podcast to find out which book I recommend for you Check out my organizing shop on Amazon which has products to help organize your home and life. Mother’s Day Reclaiming Your Space Part 1- Why is it hard for me to let go? Are you tired of your children's (who no longer live with you) stuff taking over your space? Tune in as Dr. Angela Chester shares why it may be hard for you to get rid of the stuff and your children to take it. Dr. Angela" as she is called has built a career spanning more than 25 years and thousands of people counseled. As a pastoral counselor and motivation coach, she has a deep passion for showing others how to change their perspective to change their outcomes. She teaches people how to plan and reach solutions; to look beyond the impossible. Dr. Angela has served as an associate pastor, public speaker, purpose coach, and has built a reputation as a thought leader on issues related to motivation and relationship counseling. She is frequently quoted by CNN, The Long Beach Leader, Madame Noire, The Man Registry, The Los Angeles Times and other publications in addition to holding numerous public speaking engagements throughout the year. Dr. Chester currently is a member of the International Women's Leadership Association. She holds a degree in pastoral counseling and divinity from the Trinity Institute. She is the author of numerous books, including the best selling Before You Tie the Knot – A Premarital Counseling Workbook for the D.I.Y Couple. Want a FREE audio book? Go to Audible.com and you can get one. Listen to today's podcast to find out which book I recommend for you Check out my organizing shop on Amazon which has products to help organize your home and life. Part two of my Reclaiming your space conversation with Dr. Angela Chester as she shares simple ways to take back your space move out the stuff your children left behind. Dr. Angela" as she is called has built a career spanning more than 25 years and thousands of people counseled. As a pastoral counselor and motivation coach, she has a deep passion for showing others how to change their perspective to change their outcomes. She teaches people how to plan and reach solutions; to look beyond the impossible. Dr. Angela has served as an associate pastor, public speaker, purpose coach, and has built a reputation as a thought leader on issues related to motivation and relationship counseling. She is frequently quoted by CNN, The Long Beach Leader, Madame Noire, The Man Registry, The Los Angeles Times and other publications in addition to holding numerous public speaking engagements throughout the year. Dr. Chester currently is a member of the International Women's Leadership Association. She holds a degree in pastoral counseling and divinity from the Trinity Institute. She is the author of numerous books, including the best selling Before You Tie the Knot – A Premarital Counseling Workbook for the D.I.Y Couple. Want a FREE audio book? Go to Audible.com and you can get one. Listen to today's podcast to find out which book I recommend for you Check out my organizing shop on Amazon which has products to help organize your home and life. You have finally found your new home how where do you start? Tune in as I share my strategies on having a smooth move. Janet M. Taylor podcast producer and host, has displayed an innate tendency for order since childhood. Friends even remarked on the organization of her toys. In 1994 she took her natural ability and started Totally Organized - a business dedicated to working with corporate, non-profit and government agencies saving them time and money by providing contract administration, project management and trainings to save clients time and money. In addition Janet caters to her executive client's personal needs by providing them with strategies to organize their homes and lives. Want a FREE audio book? Go to Audible.com and you can get one. Listen to today's podcast to find out which book I recommend for you Check out my organizing shop on Amazon which has products to help organize your home and life. Podcast listeners I am extending my offer to you. Get 3 Virtual Organizing Sessions with me for $59. Click this link for details. Power Up Women and Get Organized!